Who would turn down an invitation to “fly to Mars” if representatives from ESA, NASA and Poland’s Space Industry Association acted as the captains on board? Imagine if your co-passengers were some of the most promising scientists, entrepreneurs, engineers and business developers working in Poland? It sounds like a-one-of-a-kind mission to Mars inviting experts to step to the unknown and use their skills to survive. Science and technology breakthroughs have been woven in the fabric of Poland and its appetite for doing business makes it a perfect candidate for big science projects. 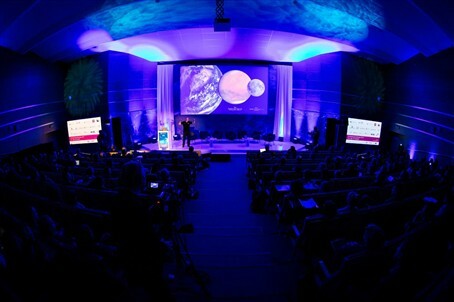 For this reason, members of the big science community coming from F4E, CERN, the European Space Observatory (ESO) and the European Spalation Source (ESS) contributed to a two day-event, organised by the Wrocław Technology Park on 23-24 November, to explain the state of play of the various scientific collaborations and the business opportunities in each of them. A fine mix of keynote speeches, workshops, presentations, and business to business (B2B) meetings gave the possibility to at least 400 participants to receive updates and get in touch with those running the projects. (L-R) Moderator: Paweł Wojtkiewicz, Polish Space Industry Association; Lucio Rossi, CERN; Arnout Tromp, European South Observatory ESO, Meredith Shirey, European Spallation Source ESS, Leonardo Biagioni, F4E. “By bringing together big science projects we help companies to learn more about the emerging technical needs, offer them incentives to export their know-how and make them think big” explains Leonardo Biagioni, F4E’s Head of Procurement. “The truth of the matter is that big projects are made of smaller ones and if a company has the skills it can surely find its way to participate. And this is what we are here to do” explains Benjamin Perier from F4E’s Market Intelligence Group. A number of companies expressed an interest in the ITER domains using robotics, aerospace technologies and the testing of new materials. For those who felt that they may not have the financial capital to target projects of such scale, a representative of the European Investment Bank (EIB) was there to present the different financial instruments that could trigger off investment and growth. The value of gathering different projects under the same roof helps all parties to be more aware of who does what and how much they share in terms of business incentives and technology transfers. For those wishing to become more familiar with the universe of collaborative procurement for research infrastructures, a Big Science Business Forum is planned to take place on 26-28 February 2018 in Copenhagen.